Add the texture and color of stained glass mosaic to painted clay pots and you have the beginnings of a great occasional table or birdbath. 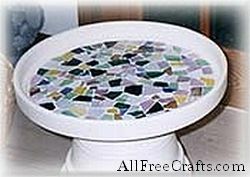 If you’re making this as a table, consider making the matching Mosaic Clay Saucer Coasters. Wouldn’t this coordinating table set look great in the gazebo or beside your favorite outdoor chair? This project also makes for a wonderful Occasional Table and you can make the matching coasters too! 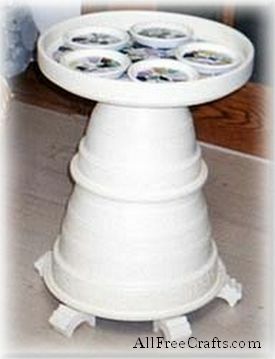 Glue your pots together and your saucer as shown in the photo. Allow the glue to dry completely, undisturbed for at least two days. Paint your pots and saucer (do not paint the bottom inside of the saucer, where you will lay your mosaics). Allow the paint to dry completely before proceeding to the next step. er, to cover the entire surface (you can begin without first placing your pieces, but if you’re new at this, lay them out first). Now that you’re happy with your pattern, begin to glue your pieces of glass in place. You don’t need a lot of glue on each piece; use just enough glue to hold the piece in place. Once you have finished gluing all your pieces in place, prepare the grout mixture as instructed on package. If you are using ready mixed grout, add a little water (drops at a time) to make spreading the grout easier. Once the pieces are secure and no longer move (this takes less than hour) spread grout over the entire top of the glass and gently press it into all the seams, making sure there are no air pockets below the grout. Allow this to sit for about ten minutes, but do not wait longer or you will have a much more difficult time removing the excess grout. With a damp sponge, gently wipe away any excess grout from the surface, rinsing your sponge constantly. Be sure to wipe away any grout that has made its way onto the painted surface (you may need to touch up the painted edge a little once the grout has dried. Wipe all grout from glass now, as you will have a terrible trying to remove it later. Allow your grout to dry overnight without disturbing it. To help protect your grout from staining use a grout sealer (available at home improvement centers), following manufacturer’s instructions. If you would like a little extra protection for your paint surface, coat with an exterior non-yellowing varnish.